My sister (the artist) was in town from Florida….and just like a whirlwind, she is headed back home. We each started a painting while she was here. She would like me to finish hers, and I will post the before and after once I have a good feeling for her artistic vision for her piece. Wanted to share mine with you today. And I just want to say……Florida, why you have to be so far away? It was nice to see them and my girl came home too, so yay! It does kinda make you long for the day when extended families all lived together, though, huh? This is my largest acrylic ever, on an 8 x 10″ stretched canvas. I really enjoyed it, and I’m glad there are more where this one came from! Maybe I really can work large! Who knew?! I need a title for this, any thoughts? Also, I have a new favorite color. Quinacridone burnt orange. I hope it exists in watercolor too! Looks like and sounds like you had a wonderful weekend Laura! Your painting looks like its on fire! A very hot color. Something like the weather here this weekend. 🙂 Enjoy the rest of your weekend. Hugs. Love that, thanks Margaret! I didn’t see the candle before, but not sure how I missed it, great interpretation! This started out as a grid-ish thing and wound up circular! We never really know, do we? hehe So glad you enjoyed it! I would call your painting “A Whirlwind Romance”. I love the warm glow of this! ❤ Sorry that your sister lives so far and has gone home. I know the feeling. My sister lives a 6 hour plane ride from me. (((((Teresa))))) wow, that would be tough. Thank God for planes tho, huh? So nice to hear about your family get together, and joint art works. I am loving this colour, if it helps you to create a title this looks like candles burning ….ones in those old fashioned candle holders, with the little round handles. Thanks Rebecca! Cool image, love it. Is this too dark do you think? Does the bottom half need lightening? Really nice orange. Warm and glowey. I thought I even saw a light bulb lying on it’s side down in the right hand corner….I’m bad with right and left but in think it was the right. Good job. Thanks Dawn. I’ve graduated to 8×10. Big for me! Do you feel like it’s too dark down below? I feel like maybe it needs more light? In my opinion only…I suppose if you want a symmetrical square of lights on your canvas as well as the possibility of ruining it….go for it. NO! Step away. When you have a painting you don’t like and don’t mind taking chances fiddle away but leave this one alone. You don’t want to kill the life. It looks great. Thank you, Dawn. Your thoughts mean a lot, as sometimes when I look at my acrylic strokes, I think about your beautiful oils! Thanks for your feedback. That’s very sweet. Thank you. I do hope you see how this painting flows? There is lots of movement but not the kind that makes you sick to your stomach. It’s a free movement. Not an anxiety provoking movement. That’s what I was trying for, thank you. I enjoy those grid compositions, but this time I was looking for circles, swirls, freedom. I’m really glad that’s how you see this. It was cool to paint “large”r. What do you consider large? This probably seems miniscule to you, lol. Yeah! So nice when things come out like you want. Hmmmm….what do I consider big? Lololol. Honestly, you are the one who pointed out that I paint big. I was amazed to see they had little 4 inch canvases. I always considered big as those things you see in galleries of men in robes and funny suits. I don’t know, 24 X 36 and larger maybe? To me 36 X 36 might have me squirming. I have no idea! I had a feeling 36 would be one of the dimensions, lol! Wow! I guess if you think about it though, how many little oil paintings do you see? And you’re pretty much an oil girl, right? I’m telling you, I was amazed when I read the dimensions of some of the paintings I have seen since I started etsy and looking at art blogs. Little tiny paintings. Very cute on their little baby easel holders. Not at all! I wonder who’s little hands can do that! More awe than anything else. You know all those little glass balls with miniature paintings inside? Don’t they make you just go wow? Besides, them little easel holders are cute!!! You have been reading your comments right? Words like glow, energy, light, warm, plus all the other nice adjectives…so there you have it. It’s beautiful as is. To me the painting reminds me of ellipses connecting visions of sorts. The circular motions (ellipses) in your paintings connect throughout the five small images (visions) you painted. I love the strong color. Possibly title your painting, Visions. Great painting, my friend. Aw thanks Connie. I really like your interpretation of visions. It was a little weird trying to fill an 8×10 canvas. Large for me! I feel like it may need more light. What do u think? Umm, Definitely a No! Your painting has movement that draws the eye around your painting, and the highlights you’ve already put in is exactly where you want the viewer to pause and ponder and interpret their own vision of what each image represents. Hmm. Ok thanks. My instinct is more light. Maybe it’s the size throwing me off. I appreciate your feedback. The color really grabs me! I like how you’ve layer the shades of color to bring dimension to your to your painting, Laura. I’m happy to hear you and your sister had a great time. Thanks so much Sharon. We really did. 😊 Do you think the bottom half is too dark? What would you do to make this better, do you think? Maybe it needs light shades of orange/yellow? Or creams? Ok thanks Sharon! I’m glad to be working a little larger. Gorgeous piece!! Fiery!! Yay! 😍 And what? Our sister is in town? Hehe…does she know about her brother in Kansas City? 😉 Sounds like a perfect weekend my friend! Thanks, Charlie! She said she will catch you on her next trip! Hehe! Glad you liked this one. I’m up to 8×10″, Charlieeeee! 💜 Pretty exciting! Good! I’m sure she missed me properly! lol And YAY! that’s getting BIG! You go! Oh LAURA LOOO! I am almost stunned silent. I have been looking at this for a long time and just AMAZED! O….. M….. G….! I need to hear more! What were you thinking while doing this? What drove it? What inspired it? I ADDDDDOOOOORREEE the colors and feel SUCH ENERGY from this piece I almost can’t type fast enough! I might call it Triple Eclipse. I see a great number of series of threes – in particular three dots. In addition – three lines on the bottom (which I must hear how you did!! Texture paste???). The circles just make me think eclipse – I think hot, sun, moon, eclipse. I see a motorcyle a unicycle a candle burning. I see circles of movement and ENERGY! I see a face even in the center towards the bottom with only one eye showing. It is fiery and thoughtful and energizing. I am EXCITED about this piece. Please tell me more about what inspired you – how you decided on each perfect amazing stroke! Are you as excited about this painting as me????!!!! I spent some time painting today and achieved pretty much nothing. I am seriously in awe of this piece. This type of genius art is so much harder than so many realize. And truthfully, you already can. Just like at the beginning, when you didn’t think you could paint. Oops! I think we can all do whatever we are passionate about and focus on. Love it! And my daughter is an artist too! So cool to think of it this way, she was here while we were painting. I would love all three of us to get together and paint. She didn’t have time to stay with us, she had someone else she needed to see, but we will do it one day. It’s a fabulous name, Jodi, I love it! You see things in this I didn’t even see. I haven’t found the motorcycle yet, but looking forward to it, lol! Laura, wonderful shapes and movement! this size 8×10 is agreeing with you, imo it allows your Arm to be freer, to move and curve and flow more!! yay! This was clever of you to move up in size, gradually. 4×4, 6×6, 8×10. Getting comfortable and ‘at ease’ before moving on!! smart woman. I do love Q. burnt orange, its also WC too. Your painting has a lovely design, great use of edges, good tones and excellent leadins. ( perhaps) the dark area on the upper left side, may be leading the eye Out – just a smidge…as its quite dark; if it was teensy lighter the eye would flow and move to the COI in the upper right. what do you think? Thanks, Debi. It’s the lower left where I’ve done most of the monkeying. :). The lower right just a bit but maybe only I would notice? I got green when I glazed the yellow over the black gesso and micaceous iron oxide (lower left) so I’ll either have to try another yellow glaze or maybe mix with a bit of Titan buff to get rid of that green. Have you ever work with micaceous iron oxide? This was my first. you know, I love that word “monkeying”…. makes me smile. much more than ‘fiddling!’ anyway…. well, yes, black + yellow makes green. now you know! it shouldn’t be so… but alas, it is. and, mica iron oxide – yup! love it! use it thinly and I scrape it along. so i can see the underlayer of color under it. I like that. when i’d used it heavy, i wasn’t as ‘happy’ with the results most of the time. (for me) we are all, different! I thought it was the micaceous iron oxide doing it, didn’t know black plus yellow is green. Thanks, Debi! The title should definitely have something to do with light. You really know how to make this paint glow. Thanks, Kerfe. I’m the youngest of nine so I have lots of both! We are all a bit wacky lol. Gotta love that Catholic upbringing (or not lol). Golden paints really do matter, IMO. They are a big part of the reason that anything I do in acrylic turns out or has light or anything. Their paint is really something. I don’t say that lightly, but there are a few things worth paying for and this is one. Very cool! It has a lot of energy. Like glasses holding lit candles looking down at them from above. Thanks, Jill! So glad you like it! Are you shocked I did something on an 8×10? I am amazed lol. Now I feel like I could go bigger. Pretty cool, never thought I’d say that. I explained to Jodi what this represents to me in a looooong message if you wanna check that out, but it was inspired by my sister, who was visiting from Florida and went home yesterday. Bittersweet. Have a great week! Aw, thanks Carrie Lynn. You’re so sweet! It was a cool time. Glad you enjoyed this! Thanks so much, Ann! That is fabric at the bottom, first time I’ve included fabric in a painting. This painting was my journey, trying to turn the sadness of my sister going back to Florida into something good. Art is the great recycler. Glad you like this! We are very lucky! I have tons of fabric and looking for ways to use it. I’ll prob include more of it! Glad you liked. I guess paper would also work, but it’s nice to use something I already have. Such an excellent piece Laura…imagine how it would look really large, like 3′ x 4′ or more. Treat yourself, if you have the space, to a big canvas, 3×4 ft or bigger. It’s a whole different painting experience, whole body, like dancing…enjoy! Thanks so much, Clinock; much appreciated! Based on my experience with this 8×10″, I really believe that is right on! I think I would enjoy painting larger at this point. Never thought I’d say that. Thanks again! I love it! I love the contrast between blocks of color and circles and I love the different shades of orange. Very zesty! Thanks, Catherine! So glad you do. It is zesty, that’s a great word! Full of energy. Appreciate you stopping by. I love the warm colors, and the candle in the top right, I see a bird lifting its wing, and a dolphins swimming in a couple of those circles. There’s so much beauty and warmth in this piece. I knew you could go big! Yeah for doing it! I’m so happy to hear you had a great week-end with your girl, and sister. Hopefully it won’t be long before you’re spending time together again. Thanks so much, Deborah. I really hope so too. It took me awhile, but I do see the bird, and the dolphins! Yay! I wish I had intentionally put them there. The top right really does look like candles, but I’m thinking of it now as me and D, together. We haven’t seen each other since I became an art addict, so this was especially cool! I may try this again with a little more intention. The swirls were really fun to do, particularly on a larger surface like this. I have (4) 20×20″ canvases and (4) 22×28″, too. If the good Lord’s willin’ and the crick don’t rise (as my dad used to say), there’ll be more to come! 😀 Thanks again, friend! I’m glad you saw the bird too, and the dolphins. Your sub-conscience at work me thinks. I love the thought of the candle being you and your sister. You are certainly are a beacon of light to me with your encouragement, excitement and energy when it comes to painting, and my photography. Loving the dance of brushstrokes over the vibrant canvas. Such a wonderful warm glow, the image feels likes it tells a story in symbols…brilliantly and beautifully done. Thanks, Haunani. I really appreciate that! Hopefully there will be more 8x10s in the future. Nothing better than getting lost in a painting. Thanks so much, Joshi. I may take this design and refine it on a completely different piece. I really appreciate your kind words. I see I’ve missed another of your posts! Glad I found it now. I love the color — it might become one of my new favorites after seeing it here — and I really like the softness of the circular motions. So much of abstract art seems to be lines and angles, and sometimes that gets a little harsh. This, though, is more “comfortable” to me, and as I look at it, I see so much waiting to be explored. To me, it’s almost like looking at lots of doorways in different places and knowing that each doorway offers a new adventure. Which one to choose? It’s a fascinating picture, very captivating. Thanks, Judith! I may revisit this design in a more planned approach. I think I prefer swirls and swoops to the hard lines of the “windows” I was doing before. And the 8×10 was liberating! I was surprised. Now I’m thinking I need to go bigger. Really glad you liked this. I see so many “adventures” in the picture…walking in the woods, being alone in the city, playing music, and slipping into the unconscious. Did you ever imagine so many different things were waiting to be found there? Nope! Not at all. I think this is why I love abstracts so much. Half of the success of any painting comes from the viewer. I didn’t purposely do much at all with this. Pretty much started out doodling in black gesso. Even the upper right wasn’t planned. I find that it kills the mojo to plan this abstract stuff at all. I’d like to revisit the swirls and that, but I wonder if I should plan anything at all beyond that. Nice that you’re finding so many adventures in this painting! 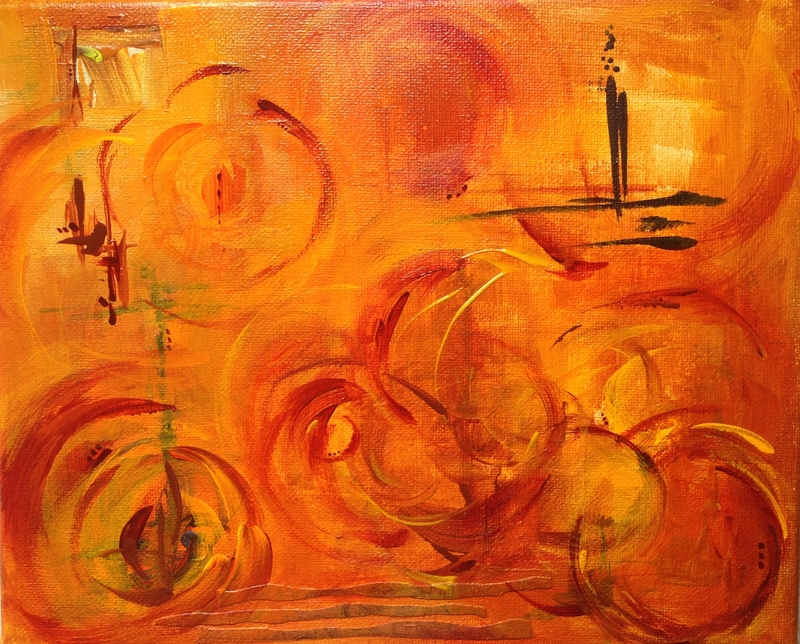 I have a post coming up…several days from now…with another abstract acrylic. This one I did do a little “planning” ahead on, and I’m not at all sure how I feel about it. I like parts of it, and other parts I think I hate now LOL. Maybe I murdered my mojo. It’s a learning experience, and I hope you’ll look at it when it posts and give me your thoughts. Abstract art is really challenging. Sure, I’ll take a look! Make a comment here if I miss it somehow. I did feel the music, both while painting and now. Interesting! I love your painting, wonderful color and shapes. I am also more of a swirls and loose lines painter – so this speaks to me very much. I love the way the textured lines (textile) at the bottom is mirrored at the top right in the black lines. Lot’s to see and the eye moves around on this painting because of all the lines. Quinacridone burnt orange is one of my fave colors in watercolor – so cool to see it here too. Thanks, Donna! This one was so much fun! Yum, yum, yummy is that orange and is that painting! I had to enlarge it to enjoy the detail. I love the color pallet you chose for your painting as well as its content. Awesome, awesome piece! You’re so kind, Cindy, thanks so much!